While many people cite WipEout 2097 as their favourite entry in the series, we’re willing to bet that many of those players missed out on the excellent WipEout 3 Special Edition. Released only in PAL territories during 2000, the game attracted little coverage and did little to bump up sales for the futuristic racing franchise after Wip3out surprisingly failed to set the world on fire the previous year. That’s a huge shame, because Wipeout 3 Special Edition isn’t just a slight improvement on Wip3out – it’s a full-blown greatest hits compilation. 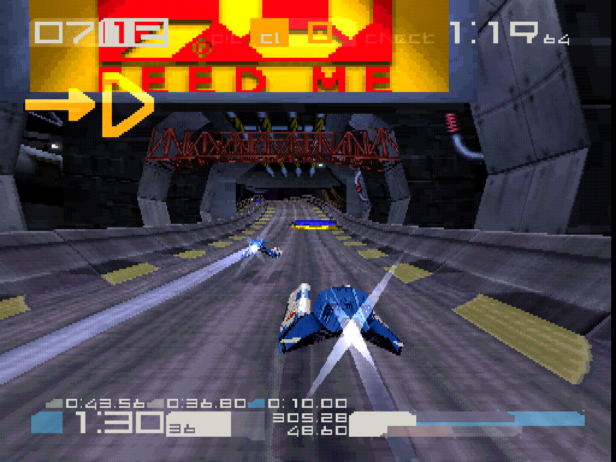 The highly refined futuristic racing gameplay is lifted directly from the third game, complete with idiosyncracies such as the boost button and weapons like the Force Wall, and its tracks, vehicles and music all come over too. However, there are some slight physics tweaks and two prototype tracks, previously exclusive to the Japanese version of the original game. Those aren’t the real story though – that honour belongs to the eight tracks lifted from previous WipEout games for the Classic League, three from the original and five from 2097. As well as offering the opportunity to play through classic races with the new vehicles and weapons, the Classic League displays the old locations with a new lick of paint, adding scenery and tidying things up to the standards expected of a PlayStation release in the year 2000. We were already fans of Wip3out, but the addition of the extra content pushed it into contention for the title of best PlayStation racer – a hotly contested one indeed. Unfortunately, the game’s relative obscurity meant that it’s often left out of that conversation, and Psygnosis Studio Leeds was shut soon after the game was released. A tragic end for a great game. If you enjoyed this profile, why not write one of your own? Click here to submit your own post for submission to the Retro Gamer website, and if it’s accepted you may even see it appear in the magazine as one of our Reader Revivals.